Last Friday, everyone was buzzing about the big werewolf transformation of Hemlock Grove, Netflix’s adaptation of the Brian McGreevy novel. ShockTillYouDrop.com spoke with executive producer Eli Roth (who directed the first episode as well) briefly about this transformation which appears in an episode directed by Deran Serafian. Serafian is where our conversation with Roth began because, in case the name doesn’t jump out at you, Serafian spent the early days of his career on the Italian horror scene before going on to produce shows like House M.D. Inside, Roth talks about the werewolf transformation, why gore has gone mainstream on television and offers an update on his cannibal film The Green Inferno. 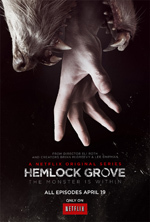 All 13 episodes of Hemlock Grove season one will be available exclusively on Netflix beginning April 19th. Shock Till You Drop: I just got done talking to Deran Serafian – who has a rich history in Italian horror and is now directing Hemlock, too. Did you bring him on board? Eli Roth: We knew Deran from his experience on House and, of course, his father directed Vanishing Point, so we knew him from that. And he told me, “You know, I shot second unit for Argento.” And I was like, “What?” And he’s the lead in Zombie 3. He had worked so closely under Fulci and Argento and that’s what I loved. We talked about the transformation and it had to be signature. I thought about the average viewers that have watched Twilight and seen the transformation of a shirtless guy walking by a tree and transforms. Our idea of a transformation is Rick Baker and Rob Bottin. So, we’ve got to do something modern that’s in the classic tradition. It has to be a violent birth, I want it to eat its placenta after and Deran was into it. It should shake off all of the blood and goo. And that’s how we approached all of the kill scenes. Obviously, we had to adhere to Netflix’s guidelines and standards, but in terms of the twists and such, we can go dark with it. Shock: How many episodes did you direct? Roth: Just the first one. I wanted to direct more, but the production moved to Toronto and pushed and I had to work on The Green Inferno in Peru. The nice thing about shooting a show that’s 13 episodes is you can change things up in the earlier episodes as you go along. You realize in episode five “Oh, we should have set this up better in episode one, so you can go back and shoot it.” The werewolf transformation, Deran was able to storyboard out and parcel it out while we’re doing ten episodes so we can get it right. Shock: How’s Green Inferno coming along?